Mosaic is named for the charitable organization that children’s author Olivia Lake (Sharon Stone) founds with the riches from her bestselling debut, Whose Woods These Are, and also for the term of art. 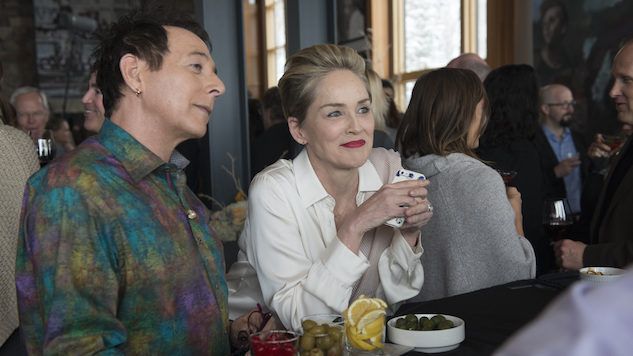 Though it premieres tonight at 8 p.m. on HBO as a (semi-) linear six-part miniseries, writer Ed Solomon and director Steven Soderbergh’s mystery fuses its stinging portrait of life among the opulent ski chalets of Summit, Utah from much smaller pieces; if you’re to watch it at all, I recommend that you do so via its mobile or desktop applications, which offer the chance to choose your own adventure through the narrative. Whether that narrative is effective in the absence of the series’ (semi-) experimental structure—whether it’s even instructive to separate the two—is an open question. In fact, it’s the question, at least for my purposes. The foremost challenge of reviewing Mosaic is determining which version of Mosaic is the Mosaic I should review, which tiles or stones or fragments of glass demand close consideration, and which merely make up the outline of Mosaic’s shape. As such, I’ve landed on an unorthodox approach: a choose-your-own-adventure review. I’m no Steven Soderbergh, so the paths through this piece aren’t nearly as intricate as those of the series — if one can call it “a series” at all, on which point please proceed to the second page — but it does seem only fair to meet Mosaic where it lives, uncomfortably poised on the frontier of TV and digital storytelling. It is, certainly, a novelty, and at times an engaging one, though as with most adventures, it is focused, most of all, on staking out new terrain; with Mosaic, Solomon and Soderbergh plant a flag for the future, but the memorable edifices must come later, after the next wave of settlers arrives in town. I’m reluctant to cite Lake here — for more on her, and Stone’s bristling performance, turn to page three — because her broader argument contains an insult to my own profession, but on the sterile affect of the Mosaic experiment, she has something of a point. “At the core of it, end of day,” she says of art, soused and slurry at Thanksgiving dinner, “you have to feel it.” This is where Mosaic departs from its namesake: As much an intellectual exercise as an emotional one, it has none of the roughness of devotional friezes or mythical inlays, none of the evidence that its virgin ground has been trod by human feet.